If you are working in a corporate sector then you must have noticed that most of the IT companies are using Active Directory on Windows Server for centralized authentication of all the employees or users but now Linux has introduced Samba3 which can be used to provide the same functionality and features without paying anything from your pocket. But Samba3 lacks some of the features of Active Directory so recently Samba4 has been launched by Samba which can used to configure Active directory Domain controller on the Linux machine and can be controlled using client software on any of the windows machine consisting of all the features of Active Directory. I won't be able to explain the feature of all the command for that you can take help of "GOOGLE" but I will try my level best from my side to explain all the required commands. You can just follow the steps which I am going to post here and if you face any problem regarding the same kindly revert back with your error. 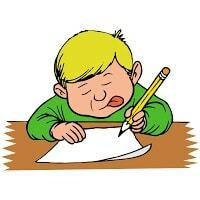 NOTE: Kindly take a backup copy of all the original configuration files you are going to use in this tutorial. First of all make sure all the required packages are installed in your system and if not you can install them using "yum"
The line domain master = yes causes Samba to be the domain master browser, which handles browsing services for the domain across multiple subnets if necessary. Although it looks very similar, local master = yes does not cause Samba to be the master browser on the subnet, but merely tells it to participate in browser elections and allow itself to win. The next two lines ensure that Samba wins the elections.Setting the preferred master parameter makes Samba force an election when it starts up. The line, domain logons = yes, is what tells Samba we want this server to handle domain logons. Defining a logon path is necessary for supporting roaming profiles. The UNC \\%L\profiles\%u refers to a share held on the samba server where the profiles are kept. The variables %L and %u are replaced by samba with the name of the server and the username of the logged on user respectively. The logon script = logon.bat line specifies the name of an MS-DOS batch file that will be executed when the client logs on to the domain. The path specified here is relative to the [netlogon] share that is defined later in the smb.conf file. When the computer account is created, two things must happen on the samba server. 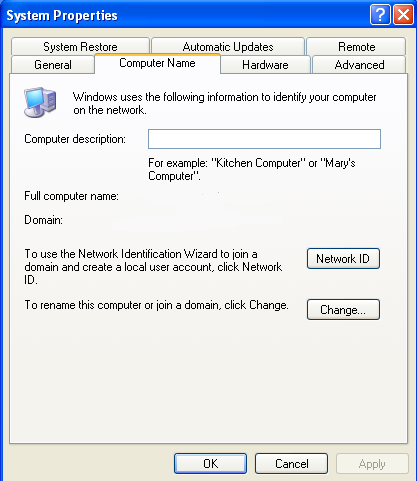 An entry is added to the smbpasswd file, with "username" that is the NetBIOS name of the computer with a $ sign appended to it. This part is handled by the smbpasswd command and you do not need to perform any additional action to it. Check your firewall settings as in my case I have disabled my firewall and selinux. Open your windows XP machine and make sure the machine is in network with the server. 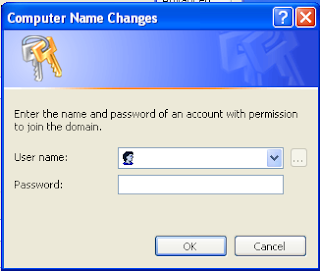 Login to the computer as Administrator or another user in the Administrators group. Right click on the "My Computer" icon and click on prperties then go to "Computer Name" tab and click on "change". 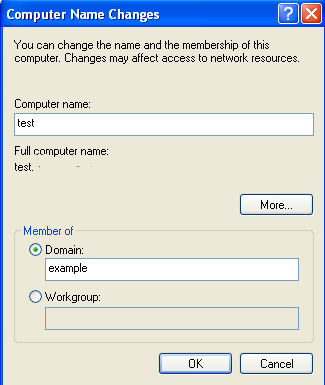 Now change your domain settings from workgroup to "EXAMPLE" and hit "OK". it will prompt for the username and password of the server and then you should get a message "Welcome to EXAMPLE" domain. 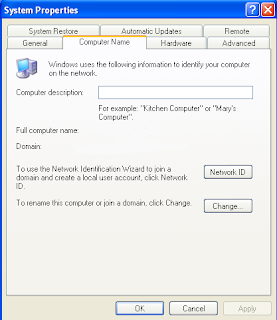 restart your machine and try to login next time using user1 which you created on the server.If you are not able to connect your machine using the above steps kindly do let me know so that I can dig further and help you out. Changing the Primary Domain DNS name of this computer to "" failed. The name will remain ".....". 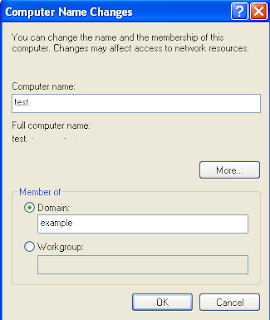 Nice post but today I apply plese help me about how to auto add in network place and easy access my samba share file.